I confess I’m a bit conflicted. Yes, I’m a University of Oregon freshman and a huge Ducks fan; however, until this September I’ve bled Cardinal red my entire life. Beginning with my first Stanford football game as a two-month-old infant, I’ve attended six to seven games a year and watched on TV nearly every game I couldn’t attend. I have been to all four recent Stanford BCS bowls: Orange (2011), Fiesta (2012), Rose (2013) and Rose (2014). So, as we count down the days until my worlds collide, I will let you in on a few insights I’ve gained over the past 18 years. How about we start with Stanford’s vaunted passing game? You may scoff at that statement, and maybe you have a point. Stanford is no Denver Broncos with Manning at the helm (although they do have Christian McCaffrey, son of Bronco great Ed McCaffrey). However, the receiving corps is veteran, returning all but one receiver — Kodi Whitfield. It also has plenty of size, including three potent receiving tight ends. Power I formation means run … not so fast. As you can see above, the first play I am going to show you is Stanford’s famed power run out of the I formation with three tight ends. Clearly, Washington State knows that this is what they are going to run, too, as they have all 11 players within eight yards of the scrimmage line. The linebackers can’t bite on Saturday like the WSU linebackers do here. 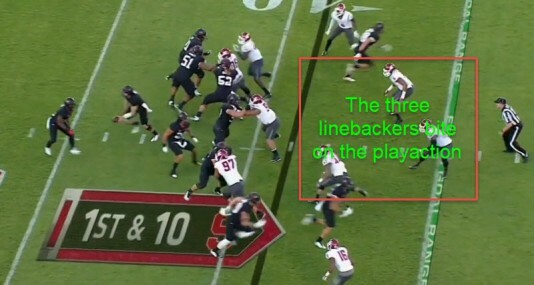 At the snap, the offensive line implements a zone-blocking scheme and Kevin Hogan (Stanford QB) hands the ball off to one of the many Stanford running backs. 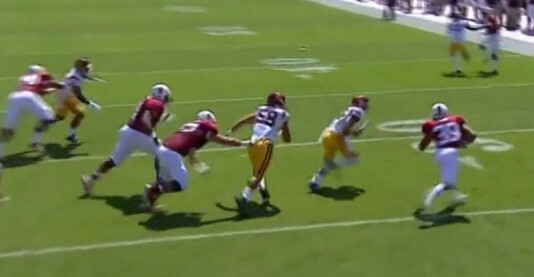 Then the running back follows his fullback through the hole … wait … Hogan still has the ball! It’s a play-action pass! 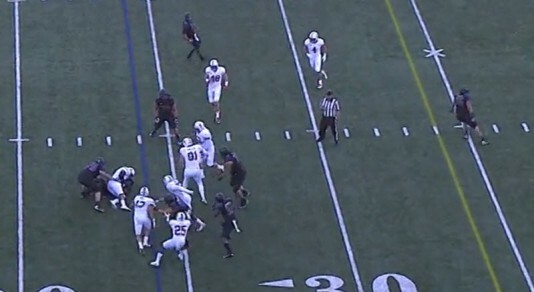 The linebacker tries to recover, but the Stanford TEs are too fast. There are three tight ends and only two safeties to cover them. The tight end lined up on the strong side of the line runs a corner route, and the other tight end lined up in the wing trails and runs a skinny post (a post pattern, except the cut is farther upfield and not as far across the field). At the same time, the third tight end runs another corner route. The safeties have decided to take away the two corner routes, leaving the tight end running the skinny post wide open. Hogan sees his tight end running free downfield, and unloads a dime. It’s a 39-yard touchdown to Eric Cotton, one of the three phenomenal young tight ends. The play-action pass is always a threat when playing Stanford. This is a dilemma that defenses face when they are up against Stanford. What are defenses supposed to do? Pick the poison. Gear up to stop the run? Despite Stanford’s struggles to find a power back this year, they can and will run the ball the entire game if you let them. Or look to stop the long ball? Hogan has demonstrated repeatedly that he can be deadly with the long ball, so is the right response dropping an extra player or two and hoping that Stanford’s high-caliber offensive line has a bad day? It’s a dilemma that keeps defensive coordinators up all night. 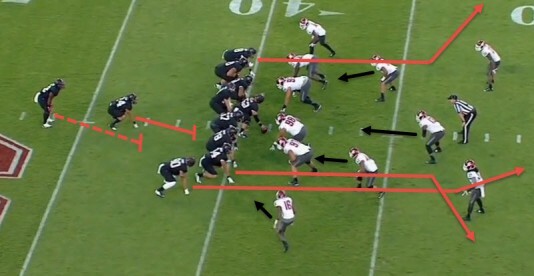 Stanford can run out of multiple formations. 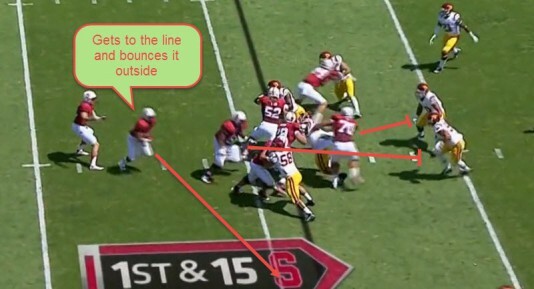 Then when Stanford lines up in the gun with three wide receivers, it can go ahead and run the ball. Just take a look at the screenshot (above), where the Cardinal has three receivers and a tight end. Last year, this formation may not have led teams to have only six players in the box, but this year it does. Stanford has, among many receivers, Ty Montgomery, an All-American caliber receiver who probably should be a tight end, but who can run like a receiver. They also have Devon Cajuste, who averaged a school record of 22.9 yards per catch last year, and Michael Rector, a speed demon. The blocking is great and the vision of the ball carrier is even better. At the snap, the left and right guards pull and block both the strong side linebacker and the strong side defensive end, respectively … and the rest of the linemen run a man-blocking scheme. Stanford also freezes the linebackers with the threat of a Kevin Hogan run. The Ducks should respect the Hogan run. We don’t want Erick Dargan or Ifo Ekpre-Olomu ending up like this Beaver safety. The running back beats USC to the edge and turns it upfield. 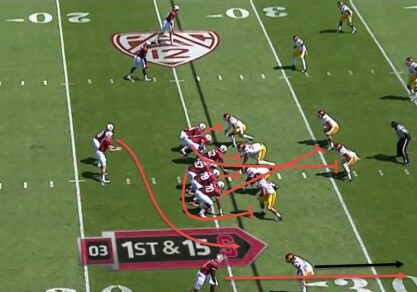 This allows the Stanford running back to get outside the tackles, where he beats the USC linebackers to the boundary. The result of this play is an 11-yard gain on first down, an extremely successful first down play. Stanford will run the ball when in the gun, unlike in past years. Now to the dominant Stanford defense. Stanford’s defense has consistently ranked as one of the best in the nation during the past four years, and this season is no different. The defense prides itself on stopping the run and having a #partyinthebackfield. Some of Stanford’s best defensive games have come against the high-powered, option-based attacks of Oregon, UCLA and Washington. So, let’s take a look at how they did this. 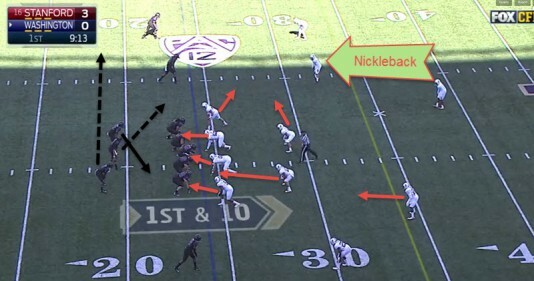 The 4-2-5 defense with the Nickleback. The key to defensive success is always in the front seven, or in this case, front six. Stanford loves its nickel defense (4-2-5); they will almost always use it against spread teams, as they did against Washington (above). The fifth defensive back, also known as the nickel back (no, not the band from the mid-2000s), for Stanford is usually breakout star Zach Hoffpauir. Hoffpauir is out for the game on Saturday and will, most likely, be replaced by Terrance Alexander. Hoffpauir has been a tackling machine; he has made numerous tackles on the perimeter, allowing Stanford to focus more on stopping the run and will be gravely missed. So, Oregon needs to take advantage of this. The spacing of the pass rushers makes this play possible. Once the ball is snapped, the right defensive end is going to drop to cover the quarterback and the wide receiver in motion. 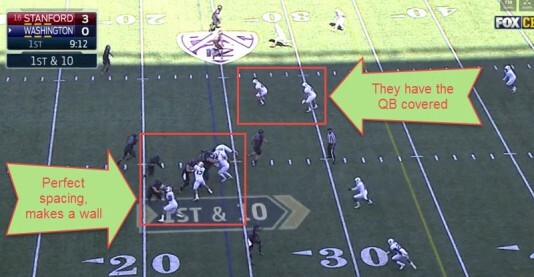 Stanford knows to do this because the receiver goes in motion, so the only way the quarterback could go if he pulls it, is to the left, toward the right defensive end who is dropping back, which he does not want to do. The key to this play is the spacing of the defenders. The players in the defensive line create an impenetrable wall by staying in their respective lanes and not drifting side to side, or getting too far upfield. The left defensive end attacks the weak side C gap; the weak side linebacker, the weak side B gap; the left defensive tackle, the weak side A gap; and the right defensive tackle, the strong side A gap. For a more in-depth look at gap assignments take a look at this article by Mr. FishDuck himself. Tackle for a one-yard loss is definitely a win for the defense. Stanford’s run D is one of the best in the nation. Two weeks ago, Stanford got some alarming news. They will be without starting defensive end Aziz Shittu for the rest of the season. Then they heard that David Parry, starting nose tackle, will miss the Oregon State game, and is questionable for the game in two days. Stanford’s defense is not at full strength. But, seeing that this did not slow them down against the Beavers last week, we clearly cannot count them out. Two things to watch out for besides the aforementioned plays are special teams’ play and the offense Stanford decides to run. When I say “offense,” I mean what tempo they are going to run. Stanford has had its greatest success on offense this season when they go up-tempo, or at least up-tempo relatively speaking for Stanford. However, as you no doubt know, Stanford has beaten the Ducks the past two years primarily as a result of its ability to keep the Oregon offense off the field. So, it’ll be a difficult decision for Coach David Shaw whether to employ his traditional offense or his up-tempo one. Montgomery can change the course of the game at any moment. The second aspect that will play a big role is the special teams. For one, Stanford has the 2013 Jet Award winner (best return specialist in the nation) who was also a pre-season All-American candidate this year. 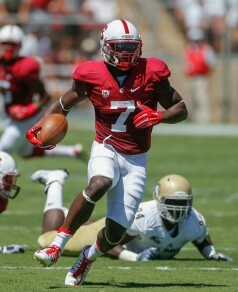 Of course, I’m talking about Ty Montgomery, who is now also returning punts for Stanford and who already has two punt returns for a touchdown this season. Stanford has become a perennial powerhouse, although the team has struggled this year. They seemed to have found their footing in last week’s 38-14 rout of the Beavers. They are prepared, disciplined and not afraid of a challenge. They pride themselves on superb tackling everywhere on the field, including the perimeter, where Oregon loves to go. Knowing this, I think Oregon is going to try to pound it up the middle a bit more and throw the ball more. On the other hand, I think that the Ducks should continue going outside and running bubble screens. After seeing every Stanford game this year, I think Stanford is much stronger in the middle of the field than people think, and with the loss of Hoffpauir, as I mentioned earlier, the sidelines will be more vulnerable. 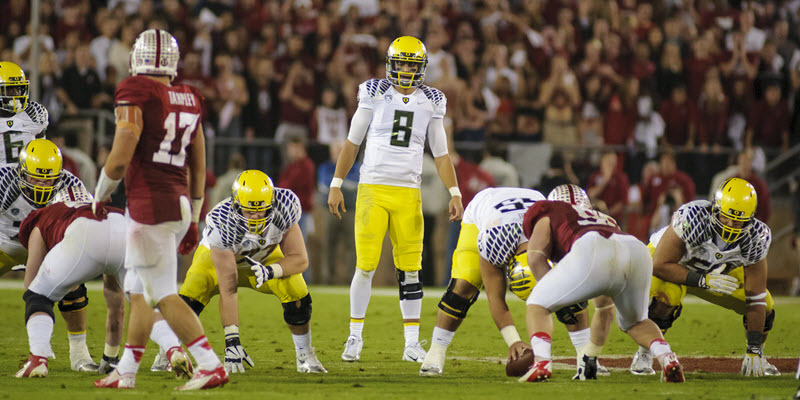 Even though Stanford has won the past two meetings and three of the last five, if the Ducks prepare diligently, pour over game film, make the proper reads and stay disciplined, Oregon should come out on top at home this year by a score of 25-13.